The Queen’s House is a former royal residence built between 1616–1619 in Greenwich, originally a few miles downriver from London, and now a district in the south east of the city. Its architect was Inigo Jones, for whom it was a crucial early commission, for Anne of Denmark, the queen of King James I of England. 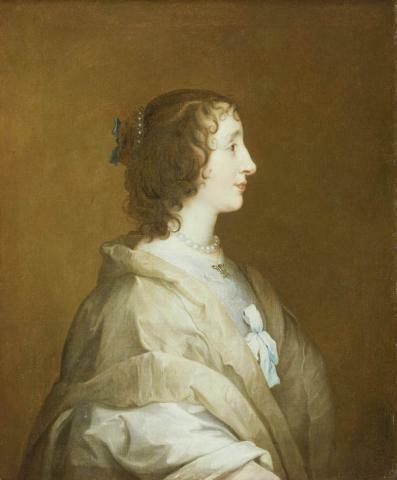 It was altered and completed by Jones, in a second campaign about 1635 for Henrietta Maria, queen of King Charles I. 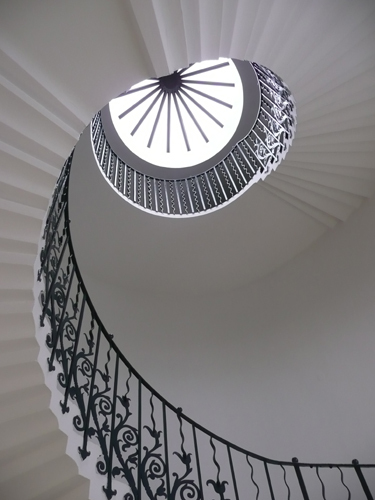 The Queen’s House is one of the most important buildings in British architectural history, being the first consciously classical building to have been constructed in Britain. It was Jones’s first major commission after returning from his 1613–1615 Grand Tour of Roman, Renaissance and Palladian architecture in Italy. 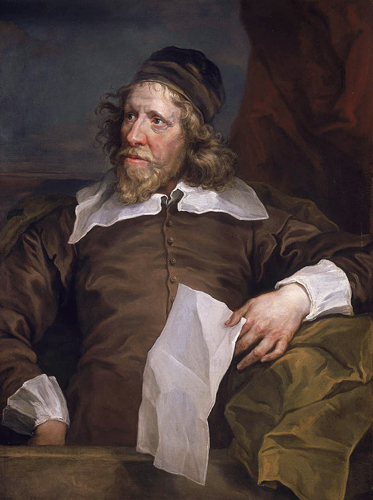 Portrait of Inigo Jones by William Hogarth. However it was not until the eighteenth century that Jones’s ideas were taken up by Lord Burlington, Colen Campbell and William Kent and disseminated widely. In Campbell’s highly important Vitruvius Britannicus of 1715 he advocated a return to the ‘Antique Simplicity of the ancients’. This was part of the architectural movement known as Neo-Palladiansism and was to lead to such buildings as Wilbury and Stourhead. It was built as an adjunct to the Tudor Palace of Greenwich, previously known, before its redevelopment by Henry VII as the Palace of Placentia, which was a rambling, mainly red-brick building in a more vernacular style. This would have presented a dramatic contrast of appearance to the newer, white-painted House, although the latter was much smaller and really a modern version of an older tradition of private ‘garden houses’, not a public building, and one used only by the queen’s privileged inner circle. However, the House’s original use was short – no more than seven years – before the English Civil War began in 1642 and swept away the court culture from which it sprang. Of its interiors, three ceilings and some wall decorations survive in part, but no interior remains in its original state. Although the House survived as an official building—being used for the lying-in-state of Commonwealth Generals-at-Sea Richard Deane (1653) and Robert Blake (1657)—the main palace was progressively demolished from the 1660s to 1690s and replaced by the Royal Hospital for Seamen, built 1696–1751 to the master-plan of Sir Christopher Wren. 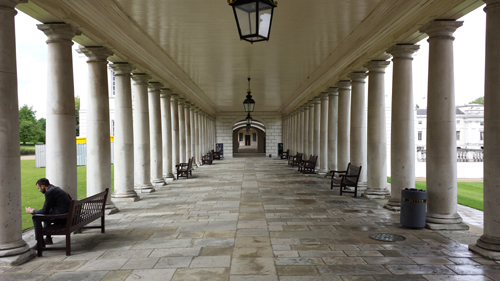 This is now called the Old Royal Naval College, after its later use from 1873 to 1998. The position of the House, and Queen Mary II’s order that it retain its view to the river (only gained on demolition of the older Palace), dictated Wren’s Hospital design of two matching pairs of ‘courts’ separated by a grand ‘visto’ exactly the width of the House (115 ft). The whole forms an impressive architectural ensemble that stretches from the Thames to Greenwich Park and is one of the principal features that in 1997 led UNESCO to inscribe ‘Maritime Greenwich’ as a World Heritage Site. From 1806 the House itself was the centre of what, from 1892, became the Royal Hospital School for the sons of seamen. This necessitated new accommodation wings, and a flanking pair to east and west were added and connected to the House by colonnades from 1807 (designed by London Docks architect Daniel Asher Alexander), with further surviving extensions up to 1876. In 1933 the school moved to Holbrook, Suffolk. 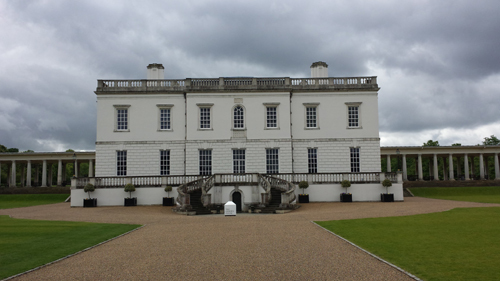 Its Greenwich buildings, including the House, were converted and restored to become the new National Maritime Museum (NMM), created by Act of Parliament in 1934 and opened in 1937. Further major restoration, including of all its services, was completed in 1990 with additional work in 1998–99. 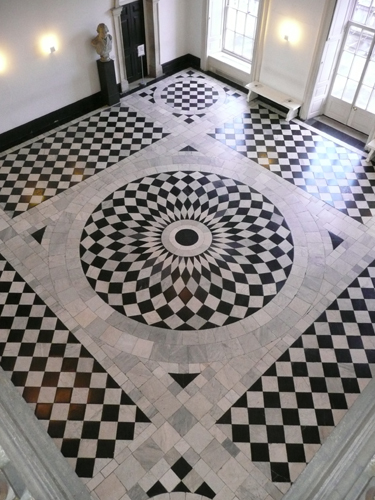 The Queen’s House is both a Grade I listed building and a Scheduled ancient monument, a status which includes the 115-foot-wide (35 m), axial vista to the River Thames. I was asked to assist with appropriate paint colours. Part of the project involved the measuring of existing external colours. Following that exercise I was commissioned to investigate the paint history of the exterior of the Queen’s House and the National Maritime Museum. More recently I was asked to develop a colour plan for the interior of the building. This was part of the exercise of representation. Using colours appropriate to its past a logical framework has been established. 1 J. Alfred Gotch. 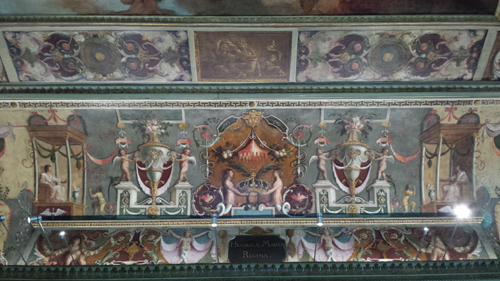 Inigo Jones. London. 1928. pp.81-82. This has been taken largely from Wikipedia and the website of The Queen’s House.